At the start of the week we were asking if one of the previous champions would reign supreme again or if a fifth new champion in five years would be crowned, but as the end of the final day of the 2014 KIA Cold Hawaii PWA World Cup approached, everyone was left asking if anyone would be crowned champion at all. 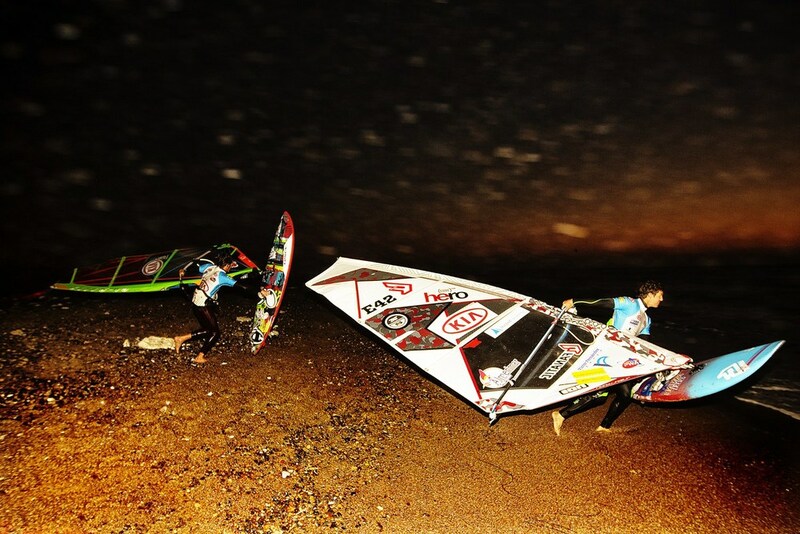 However, Cold Hawaii somehow produced the goods again, despite the fading hopes - and rapidly fading light - as the wind and waves returned just in the nick of time to see Thomas Traversa claim victory in almost complete darkness. Today goes down as a historic day for both the event, which has now produced a result for five successive years, and of course Traversa, who becomes the first man to win two Cold Hawaii Crowns, having previously claimed his maiden victory on the PWA Wave World Tour here in 2012. Victor Fernandez came into the event as the current world tour leader and the Spaniard continued his superb form to book his place in the final, alongside Thomas Traversa after the duo defeated Leon Jamaer and Robby Swift, respectively in the semifinals. However, the winners’ final wasn’t just a battle between the last two men standing, but also a fight against time as darkness moved in. Despite the dark, both sailors continued to perform terrifically well, especially considering the extremely challenging conditions on offer. Fernandez ruled in the air as he stomped a tabletop forward, but there was no stopping TT on the wave as he wracked up 9 and 8.25 point waves to claim an emphatic victory. The Frenchman was the standout sailor throughout the day, especially on the wave as he showed unrivalled fluidity and speed to pull of crazy frontside aerials and takas. Earlier in the evening Leon Jamaer claimed the biggest scalp of his career, so far, as he took down the two-time world champion - Philip Köster. Jamaer showed superior wave selection, together with big powerful hacks to progress. However, Köster had his chances, but for once couldn’t capitalise, but he was still the only man to land a double forward in the contest. Victory against Köster, secured Jamaer his first place in the top three and the same was true for his teammate Robby Swift, who defeated the reigning world champion, Marcilio ‘Brawzinho’ Browne, to secure his maiden finish on the podium in joint third. On his way to third place, Swift landed a sick frontside aerial and was clearly delighted afterwards. Elsewhere, Graham Ezzy stole victory against Jules Denel with the final wave of the heat in what was an incredibly close fought contest, whilst teammates, Adam Lewis and Alessio Stillrich also enjoyed a tight battle in the first round, but in the end Lewis just edged the duel. Antoine Martin was unlucky in heat 10b as he suffered a broken mast, whilst battling against Philip Köster. When the Frenchman returned to the water, he was underpowered and couldn’t take the potential opening to progress. The end of a long, but in the end successful day, came shortly before 8:30pm to cap another great week in Cold Hawaii, which once again showed a wide range of conditions. Not sure how - click here. There is a fishing boat, grounded, 50 meters from the beach in Klitmøller - right where the world's best wave windsurfers will sail, today, in this year's PWA World Cup in Cold Hawaii. “It's like the boat just got placed, right in the middle of the park”, said event manager, Robert Sand. A medium sized fishing boat has run aground on the reef, at Ørhage, where the world's 32 best wave windsurfers, this afternoon, will embark on this year's World Cup in Cold Hawaii. The fishing vessel ran aground during the night and is located about 50 meters from the beach. “It means that there is a fishing boat in the middle of the park! I think we can continue the competition, but it is annoying for surfers to sail around a grounded boat. If nothing else, people will remember the 2014 edition of the KIA Cold Hawaii PWA World Cup for years, as the place where surfers had to navigate around a fishing boat”, says a positive, Robert. The alarm went at 04:10 to Coastal Rescue in Hanstholm, which sent a lifeboat and rescued the crew from the cutter. The rescue operation was in close dialogue with the Admiral Danish Fleet, which gave the order that the ship, for environmental and legal reasons, would be towed away tonight. It is supposedly up to the owner and his insurance company when it should happen. The cutter was reportedly on the way from Hanstholm to the south, when it run aground, for unknown reasons. The KIA Cold Hawaii PWA World Cup competition opens today at. 12:30, and the first surfers come on the water at 13:00, if weather conditions permit. Right now, with the wind and waves how they are, it’s a close call. The world’s best wave windsurfers are only gearing up for the 2014 KIA Cold Hawaii PWA World Cup in Klitmøller, Denmark from September 15-21 after the kind of stirring local support that is the stuff of windsurfing lore and Hollywood scripts. The world cup event in Klitmøller has always had a touch of the Field of Dreams “build it and he will come” since being started by local windsurfers in 2010, but the past year has seen a cocklewarming rescue and phoenix-like rise. With four different champions in four years the Cold Hawaii world cup had already established itself as the most exciting and unpredictable event on the tour, even without the drama of the last year. The competition will doubtless be epic again with a star-studded entry list with the champion, Brazil’s Daniel “Brawzinho” Browne, looking to retain his crown and Philip Köster, Germany’s double world champion wunderkind, who was sensationally beaten in the final last year, looking for revenge. But the real story is that Cold Hawaii 5 is happening at all. That the 2014 event exists is because of a groundswell of support from the community. Increased volunteer support from Klitmøller and the Cold Hawaii coastal region has been underpinned by a three-year agreement with Thisted Forsikring, a local Danish insurance company, and a significant contribution from hy-Mors HF & VUC, a local education body. Sand, the Danish wave champion 2003-05 and a Klitmøller windsurfer for 25 years, is one of core group who have made this event and sweated blood and tears to save it. Kevin Costner’s Dreams and Waterworld days are behind him now, but what price Ryan Gosling or Michael Fassbender as the appropriately-named Sand in a forthcoming feature film? Cold Hawaii 5 looks more open than ever with the Spaniard Victor Fernández-López, the 2010 world champion (when he was second in Cold Hawaii) leading the tour after winning in Gran Canaria and coming second in Tenerife. Fernández-López will need little motivation after his shock early exit last year. Jaeger Stone, the Australian rider who is lying 3rd on the tour after two great comeback events, will also be trying to prove he is man enough for Cold Hawaii at his first attempt in Klitmøller. Download image of winner in 2010 (Kauli Seadi) - here. Download image of winner in 2011 (Philip Köster) - here. Download image of winner in 2012 (Thomas Traversa) - here. Download image of winner in 2013 (Marcilio Browne) - here. In 2014 everyone can have Cold Hawaii dreams. Yes, you heard right. For €0, you can support the Cold Hawaii PWA World Cup with €13. All you have to do is to create an account with Airbnb and they will pay the event €13. Furthermore, you'll receive €19 in travel credit with Airbnb. Visit our campaign site to see how. This is the “Airbnb loves Cold Hawaii” campaign. It’s easy for you and a big, big help to us, if you choose to use the 3 minutes it takes. If you have questions you can get answers to most of them – in Danish, German and English. The campaign is the happy consequence of a partnership Friends of Cold Hawaii – the volunteer organization behind the Cold Hawaii PWA World Cup – has made with Airbnb. So what is Airbnb? Airbnb is a website. People use it to either rent out accommodation or look for accommodation to rent. The special feature is that the tenant and the owner can be anybody who regularly or occasionally has availability. This means that you can rent a room, your apartment or your house. MANY people already do this. Through Airbnb, more than 17 million people have spent a night in one of over 34,000 cities in one of 190 countries where people rent out their houses, apartments, rooms, annexes, yachts, etc. through Airbnb. They stay in people's homes and this give them a different and more authentic experience of the place they are visiting. The beauty of this partnership is that Airbnb is a really cool product. Furthermore there's a true connection between the service Airbnb provides and our ability to get around and visit the places and be a part of the cultures that we – as surfers – enjoy so much. We view Cold Hawaii as one of many surf destinations and a part of the global culture that links surfers together for a unique experience. Airbnb gives you the opportunity to meet "the locals" in their homes and invite "non-locals" into your own. We think that Airbnb can bridge the gap between people and strengthen existing friendships. When it comes down to it, surf culture is all about people. You just have to get to know them. As many of you know, this year's Cold Hawaii PWA World Cup has more than ever in the event's history, been marked by ups and downs. Most remember that 2014 was, indeed, canceled. Only thanks to a group of trusted sponsors, and strong local commitment, did we manage to arrive at a solution that will make it possible to hold the Cold Hawaii PWA World Cup in 2014. But that doesn't change the fact that money is always an issue and therefore we would be so grateful if you would use 3 minutes to participate in our campaign. We promise you won't be disappointed. Find "We need you" image here.